Affectionately known as an airport with Solera, after the famous method of producing Sherry. This is a quiet airport looking a little tired but a perfect alternative to Sevilla with access to Jerez, Cadiz, Tarifa and the Costa de la Luz. It is also an alternative for the western end of the Costa del Sol being 90 min motorway drive to Estepona. These are the airlines that have direct flights to and from Jerez de la Frontera Airport and the following cities. Correct as of Febuary 2017. A petrol station is marked on the map and is located about 1km from the airport. There is Car open air parking right opposite the terminal (P1) available for 450 cars with a second car park (P2) for 350 cars few minutes walk away. Cost per minute is .03 € or about 1.85€ per hour; Maximum daily up to four days is 11,20€; thereafter 8,95 € per day. Lost ticket 45 €. An un attended and unlit long stay off site private car park is found on the airport access road called Olof Park. Cost is 5€ per day, leave money in an envelope with car reg in the letter box in the caravan. The parking has no transport service to the terminal, it is 10 mins walk so drop passengers and luggage off first. The walk to airport is safe but unlit at night. There are several bus routes which serves Jerez Airport. These are M-050, M053, M-561, M970. In 2011 the Jerez airport train station opened. 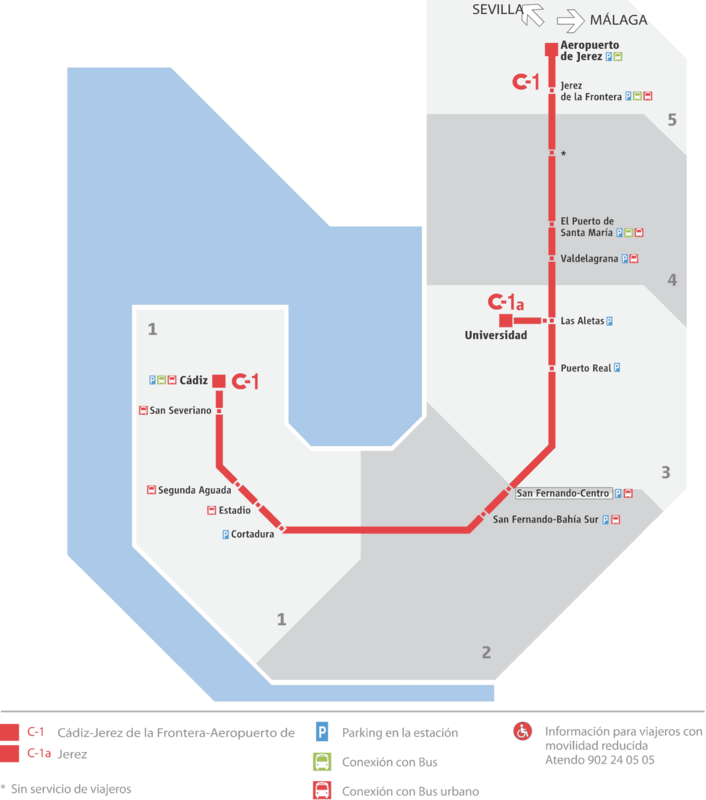 Three trains a day on the "Cadiz Cercanias" C1 route from Cadiz, San Fernando, Valdegrana, Puerto Santa Maria, (and others see map) and Jerez town continue to the airport. These trains Trains arrive at 08.09, 13.09 and 19.09 hrs and depart the airport at 08.26, 13.26, and 19.16. The cost of Jerez is 2.45€ single. The cost all the way to Cadiz is about 6 euro adult single and 10 euro adult return. Check for posible updated times within a month of your journey. In addition to this there are about eight trains a day in the Cadiz to Jerez to Seville to Jaen regional route. which you can take to Jerez de la Frontera town, or futher afield to Puerto de Santa Maria, Puerto Real, San Fernando-Bahia Sur, Cadiz. These depart at 07.36, 09.20, 11.43, 13.45, 15.27, 17.41, 18.44, 22.48. The cost of Jerez is 2.45€ single. Check for posible updated times within a month of your journey. In the oposite direction, trains arrive at the Jerez airport from Cadiz, San Fernando-Bahia Sur, Puerto Real, Puerto de Santa Maria, Jerez de la Frontera town at 06.17, 07.15, 10.15, 12.15, 15.15, 16.15, 18.14, 19.14 and depart for Librija, Utrera, Dos Hermanos, Sevilla-Virgin del Rocio, Sevilla-San Bernardo, Sevilla Santa Justa with the 06.17, 12.15, 18.14 carring on past Seville to Lora del Rio, Peñaflor, Palma del Rio, Posadas, Cordoba, Villa del Rio, Andujar, Espeluy, Jaen. Check for posible updated times within a month of your journey. Tickets on the Regionial Service from Jerez to Puerto de Santa Maria, Puerto Real, San Fernando-Bahia Sur, Cadiz can in the other direction to Librija, Utrera, Dos Hermanos and Seville and stations on to Jerez can be purchased online here. The nearest airport hotels are in Jerez town. Hotel Jerez and Spa and Hotel H2 Jerez are the nearest. Find a hotel using the search box below or reading our Jerez Hotels page. There are no telescopic boarding utilities, you walk across the tarmac like the good old days. The first floor café above the check in desks used to have a commanding view of the airoplanes and passengers from behind glass of the tarmac apron and runway but this is now partly obscured by the baggage handling facility. There are also cafés in the check in hall and after security, in the departure lounge. The airport has one runway 2300m long and 45m wide known as 03-21 with a capacity of only ten flight movements an hour due to the need for aircraft to backtrack on the runway. The commercial apron has room for six aircrafts. The passenger terminal was built in 1992 and has a capacity of 1200 passengers an hour. The airport recorded 823 thousand passenger movements in 2015. Its peak was in in 2007 when it recorded 1.6 million passenger movements. There are a number of well established flight training companies at the airport. Their offices and facilities are in a zone to the south of the main terminal building near where the original terminal (demolished in 2008) stood. Signposted to turn right at the first roundabout when arriving at the airport. Book with Zest Car Rental for a fair fuel policy and unlimited mileage included. Low cost pre-booked shuttle transfers from Jerez airport to your hotel and other Andalusia destinations. Fly with British Airways, offering year-round low fares with an extensive global route network from Jerez to many locations code-share with Iberia via Madrid. Best prices for Iberia Flights to UK, Spain, Europe and Worldwide.